Marini's world is one in which important work on Liturgy or its sociology or its ritual analogues since 1990 or even earlier has simply not happened. He ignores Anglican Liturgists such as Michael Moreton or Geoffrey Willis or Catherine Pickstock (After Writing, 1998). Well, I suppose we poor schismatics cannot merit the condescension of the notice of so grand a man. But he also ignores Aidan Nichols (Looking at Liturgy, 1996), not to mention Joseph Ratzinger, whom he is known to have met. Are they really so negligible? Rather like an aging neo-Nazi who sleeps with a poster of Hitler over his bed, Archbishop Marini lives in a long-dead world whose heroes and villains, slogans and manifestoes, are those of an earlier generation whose glories must not be tarnished by any admission that something of significance might have been written since. A very happy occasion last night at the Oratory when Fr Joseph was priested (as we Anglicans term it). And how different the ethos from that of an Anglican ordination. With us, it is very much more prelatical. A man from Mars would assume that an all-important individual in a hat was doing things to a suppliant. In the Roman Rite - even the new one - there is a greater sense of the whole church - especially the presbyterium - engaged together. The man from Mars would, I think, go away with the idea that the ordinand was being admitted to a (presbyteral) club. Some Anglican bishops are so deeply mired in prelatical arrogance that they have started issuing edicts claiming that the participation in the laying-on-of-hands by the presbyterium is 'simply a blessing' and not an organic part of the rite of priestly ordination. And this is despite the fact that Anglican sources, like the Catechism of the Catholic Chuch, make very clear that the action is a profound expression of collegiality. Christ shows us that the Cosmos must become Liturgy, Glory of God, and that adoration is the beginning of the true transformation, the true renewal, of the world. Have I got this right? The Holy Father will have His All-Holiness Pariarch Bartholomew of Constantinople and New Rome with him in the liturgy in S Peter's this coming Sunday, the Solemnity of S Peter; and among those on whom he will on this occasion confer the pallium is a Byzantine Rite ('uniate') Archbishop? If this is so, is it not an important shift in the attitude of the Phanar to 'uniates'? Two more of the honorands are Latin Rite Archbishops within what has been termed the Canonical Territory of the Moskow Patriarchate. Will this have any bearing on the trifocal relationship between Rome, Constantinople, and Moskow? NLM calls, as I did in an earlier post, for much prayer for SSPX. At S Thomas's this morning we had a Votive for Christian Unity. Whenever I say this wonderful old Votive the years fall away and I remember how it felt back in the 1960s, when Unity seemed to all of us both a divine imperative and a real possibility; when it seemed that the old divisions were crumbling; when we all believed it was inconceivable that anyone could be so wicked as to introduce new divisions; before the dark days came and foolish people were persuaded by the Evil One that not only are genderist deformations in Holy Order and in Liturgy right in themselves, but that they are so urgently right that their necessity transcends God's call to Unity. My Name Day. Am I the only person who observes his Name Day with more enthusiasm than his birthday? Today I say the Johannine Mysteries of the Holy Rosary (The Annunciation to Zacharias; The Visitation; The Nativity of S JB; The Lord's Baptism; The Decollation) and, Deo volente, have supper this evening with my bishop. Incidentally, without in the least wishing to denigrate the cult of S Joseph, I do rather feel that in our Counter-Reformation Latin Christian culture it has slightly overshadowed the perhaps more primitive and ecumenical cult of S John Baptist, the greatest of the Old Covenant and a reminder of our kinship with the People of the Prophets. I think next Monday is the twentieth anniversary of the Econne Consecrations; we pray for bishops, priests and seminarians of the SSPX and their lay adherents. And for Benedict XVI who has extended such a generous hand of reconciliation to them. I suspect it is not always realised what an agony it must be for him, on the one hand, to feel he must attempt a collegial and consensual exercise of the Petrine Ministry with his Venerable Brethren, and, on the other hand, to believe (as he said after his inauguration) that he, before all others, will be asked to give an account of what he has done for Christian Unity. We know how many of his Bishops are doubtful about initiatives to Lefebvreists or to Catholic Anglicans; and we remember how Cardinal Ratzinger observed in the early 1990s 'What are the [English RC] bishops so afraid of?' May we have the grace, on our part, to be prepared to accept with love what the Spirit is doing through him. 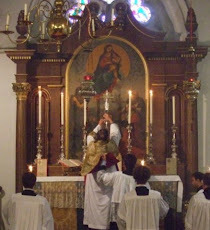 It has to be a good idea to think of a better way of refering to what has variously been called the Tridentine rite, the Traditional Rite, the Usus Antiquior, and the Extraordinary Form. But I'm not convinced that Cardinal Castrillon Hoyos has hit a winner with 'the Gregorian Rite'. Firstly: Summorum Ponyificum cleverly made clear that the EF is not a separate rite; if it had been, there would have been enormous canonical problems about its status and the acquiring of permission to say it. By emphasising that there is only one Roman Rite but that there are two forms of it, the Holy Father sidestepped that. But also, historically, why 'Gregorian'? The elements of the Ordo Missae as they left the revising hand of Pope S Gregory I remain in the post-conciliar rite - at least in that usage of it which sticks to the Canon Romanus - with few changes I can think of off-hand: in the Institution Narrative and in the Libera nos. The preparation at the foot of the Altar; the private prayers at the Offertory and before communion, are post -Gregorian. The Sarum Rite, for example, had quite different texts. There must be a better term. Otherwise, calling it the Extraordinary Form might have one apologetic advantage: Bishops could be asked to oppose the Extraordinary Form no more than they oppose Extraordinary Eucharistic Ministers. May I briefly ask anybody who reads this blog to give me any helpful thoughts they may have on this subject? My problem: I understand the principle that liturgy should evolve gradually and organically, and approve strongly of it. But what happens when there has been a rupture in the past? As an Anglican, I might have had in mind the rupture of 1559, when, overnight, the Sarum dialect of the Roman Rite was replaced with (substantially) what we now call 'the 1662 Rite'. But let's consider instead the rupture over a period of less than half a decade when the Missal of S Pius V (substantially) was replaced with a rite which had important structural and textual and ritual differences: for example: the interface between the Canon Romanus silently in Latin, and the pseudo-Hippolytan prayer in ICEL English, is violent and nonorganic. Fair enough: that should not have happened. But it did happen, and well over a generation ago. The cuckoo in the nest of the Latin Church is now established and, as we might say, 'in possession'. What are we to say to someone who uses the doctrine of organic development to argue for nothing more than the slowest and most gradual process of Reforming the Reform? There were Catholic Anglican priests who took over churches where Prayer Book Mattins was the communal rite 'in possession' and replaced it with the Tridentine Mass on their first Sunday. Was this organic? ...are the words written on the book at the centre of the Arms of the University of Oxford; they are the opening words also of the old Mass for last Sunday and for the ferias of this week (the arrangement of the Masses for the Sundays After Trinity, which we Anglicans inherit from the Sarum variant of the medieval Roman Rite, is out of sync' with the arrangement of the Masses After Pentecost in the Missal of S Pius V). By a happy chance, if there is such a thing as chance, Wednesday of this week was also the occasion of Encaenia - the annual corporate celebration of the University, when, to the accompaniment of Latin speeches, honorary degrees are conferred and the Oratio Creweiana describes the life of the University during the past year. The Orator Publicus, Richard Jenkyns, at the end of a witty oration listed our defuncti and concluded: Requiescant in pace; luceat eis Dominus Illuminatio Mea. And a very great Oxford theologian died on Tuesday of this week: Henry Chadwick, priest and scholar, one of the most distinguished of the contributers to ARCIC; Dean of Christ Church Cathedral and of the College of that name; one a rare breed of those who, at different times, have headed a house both in Oxford and in Cambridge. I said a requiem for him this morning; as a canon of Christ Church he was one of the members of the presbyterium of Harry Carpenter who laid hands on me forty years ago. Henry Chadwick had a dislike of the vulgarities of ecclesiastical politics and of party warfare. His immense erudition meant that in controversial matters he was able, and very much preferred, to find unities deeply underlying what appeared on the surface to be opposing positions. That was a strength which was a tremendous advantage in the old Church of England: a body which, because it had mutually accepted structures of Catholic Order, was able to encompass a considerable variety. Whatever purists may think of such ecclesial untidiness, it did work; I can recall so very many people who were able, gradually and within that stable environment, to come eventually to an understanding of the fulness of the Catholic Faith. This possibility of gradual growth and advance brought many to Catholicism who, if they had been faced by a stark choice of whether to accept the whole package at once, might never have been able to do so. I find it hard to abandon a conviction that such a situation was within God's providence. But it was a situation made possible by the near collapse of many of the old heresies, or at least the weakening of their power to grip and blind and polarise people. That was the environment in which early ARCIC flourished and in which Henry Chadwick was the man of the moment. Unfortunately, as the old heresies either lay down and died, or else became limp-wristed, we soon rediscovered our Lord's warning that Satan abhors a vacuum. Effete Protestantism was replaced by strident Feminisms determined to rewrite the doctrine of the Trinity, overturn Catholic Order, eviscerate Scripture, and pervert the texts and logic of liturgical formulae. The gift the Lord gave Henry Chadwick, of achieving quiet synthesis through courtesy, erudition, and the avoidance of shrilly opposed positions, was left behind in the inevitable, hard polarisation of a world in which, after all, ordained women either are, or are not, priests and the bread and wine on their tables either are or are not the True Body and Blood of the Incarnate Divine Word and right reverend women are either successors of the Apostles or well-meaning imposters. As I pray that he may rest in piece, I have a feeling that it is all that was best in the old Church of England that I am saying farewell to. While Dean Inge refused to collect postage stamps and Lord Brideshead did collect match-box labels, my own need for trivia is satisfied by collecting the Deeply Ridiculous; whom I divide up into five categories: A, B, C, D, and E (A being the most exotically ridiculous). I am tickled pink to have gained a new item for my A list: one Elena Curti, whom I have acquired from Damian Thompson's account of the Cardinal Castillon Hoyos news conference. We were taught that the new rite represented real progress, and many of us who have grown up with it see it as real progress, that there are Eucharistic ministers, women on the sanctuary, that we are all priests, prophets and kings. Isn't that superb? For this poor, sad, dim creature, the Liturgical Movement which culminated in the post-Conciliar rite is characterised, not by euchological riches newly gathered in from the two-thousand-year tradition of the Church's worship, not by the rich diet of a Three year Sunday cycle of Biblical readings and the Weekday Lectionary, not by the access gained to all this by the use of the vernacular (please understand that I realise qualifications could be set beside each of these; I am speaking purely ad hominem, indeed ad Feminam) but by Eucharistic Ministers (I imagine she means Extraordinary ones) and women on (I presume she means 'in') the sanctuary. All St Bugnini's labours, the man-and-woman hours devoted by ICEL to their literary masterpieces, even all this pales into insignificance beside the spectacle of lay people administering the Sacrament and women wearing fancy collars to do so: features never envisaged by the Council Fathers and very probably not even by St Bugnini. But Elena (is it possible to get pin-up pictures of her? autographed ones?) can do even better than this. We are all priests, prophets and kings. She gives this Biblical formula a functional hermeneutic; it apparently means laymen and laywomen performing sacerdotal or clerical functions in the Liturgy. I wonder how far she takes that game. I have a vision of this gorgeously silly woman going up to one of the guardsmen outside Buck House, explaining her regal status to him, and demanding to be taken to the throne room. Or writing to the Comptroller of the Household with a request to be put on the rota for presiding at the Trooping of the Colour. I think she deserves a professorship named in her honour; perhaps 'The Elena Curti Chair in Popular Liturgics'. Alcuin Reid would make a wonderful first holder of this honour. Remarkable, isn't it, that Ireland, where little more than a generation ago the Church could expect to be taken seriously when it exhorted the young, especially young women, on the meaning, function, and necessity of modesty, now has to be lectured on this essential Christian virtue by an intelligent young woman who has discovered it for herself by drawing upon the reserves of her Islamic culture in the contexrt of modern, dissolute Western culture. More than that: is this the real Inter-Faith dialogue that we ought to be engaging in? Recovering our Christian culture and identity from sources where it has been, I dare to say, by the grace of God, preserved in times when the smoke of Satan even within the Church has led to our forgetting it? Secularists have used an excuse of multiculturalism to hammer Christianity; our own liberal Christian Treasonable Clerks have used Inter-Faith dialogue as a pretext for relativising Christianity. If Moslems can teach us how to fast, how to be modest, and who knows what else, will they not have taught us to be better Christians? And will they not take our Faith more seriously than when they see Christians apparently surrendering hook, line, and sinker? And might not this be a prerequisite for real mission, enabling Moslems to understand that faith in the One Saviour and Redeemer of Mankind would not mean accepting 'Western Culture' - but just the opposite? And it reminded me of what Ebbsfleet and Forward in Faith events are like. Mind you, at Westminster there was a feature rarely common in the Church of England: the small, glowing chattering Philippino ladies running round our legs with their bags of pious goodies just bought from one of the shops: 'Father, will you bless these?' We could do with a few shiploads of them at S Thomas's. I'd bless their nick-nacks any day of the week. I found myself wondering if this is what all new movements of the Spirit are like. Could it be that when old cultures have had their time, are crumbling, have the grass growing all over them, God's New Gift is very probably going to look like this? There was another thing that reminded me of our Anglican experience. Betjeman's poem speaks of 'extreme ' colonial bishops leading us in song, and Eric Mascall's brilliantly satirised 'Ultra Catholic' got his Confirmations done by colonial bishops from far-off Mission Stations. For perhaps obvious reasons, Roman Catholic traditionalists, while happy enough to host one of Cormac's suffragans when offered, seem to come into their element when they get a Latin American bishop or Cardinal. I suspect that there is here a break-down, not of canonical proprieties (because I am sure that all the correct procedures are gone through on these occasions) but of previous associations and bondings. Ditto with us. Yesterday, at Westminster, it was very good to see our beloved Roman Catholic brethren getting a glimpse of the Waking Days. A friend has brought me back a beautifully produced ORDO MISSAE CELEBRANDAE for the Sundays of Eastertide from the Vatican Basilica. Great fun to read. Two minor points ... and one point rather less minorish. (1) ORDO MISSAE CELEBRANDAE leads one to expect what we call 'an Ordo'; the sort of Kalendar thinggy which I compile (have you bought your 2009 copy yet?). But this booklet is what we Anglicans call an 'Order of Service', with the texts printed. (2) Faulty Latinity. Whoever wrote 'Collecta de Dominica occurrentis' needs a swish with an old-style schoolmasterly cane. But I never do read any piece of liturgical Latin that emerges from Rome without being made to wince. (3) Apparently, in one of the senior churches in the Christian world, only Eucharistic Prayers 2 and 3 are used. Never, apparently, the Canon Romanus, the ancient Roman prayer which Joseph Ratzinger used at the funeral of John Paul II and at his own inauguration and which, ever since the Novus Ordo Mass was authorised in 1969, has been recommended (opportunius dicitur) on Sundays 'unless, for pastoral reasons, another Prayer be preferred'. To say that the mere fact of its length creates a regular presumption that it is pastorally undesirable (and that's what one is tempted to suspect is going on here) is to evacuate that recommendation of all content. The 1969 Institutio also says that Prayer 2 is meant for (opportunius sumitur) weekdays or special situations (in peculiaribus rerum adiunctis). Again, to decide that a special situation permanently exists in S Peter's Rome is to show a cavalier disregard for what even those who created the post-Conciliar rites expected. Benedict XVI has given a lead in this matter. Reforming the Reform often means taking seriously what the reformed rites actually themselves ask for. In this matter, the 1969 Institutio is itself an expression of the Hermeneutic of Continuity. ... included one from our oldest parishioner, Audrey Bates, who never lets anything wipe the smile off her face. She had crafted it herself, and how beautifully. And one from Jill Pinnock, so suitably reproducing the Great Doxology at the end of the Roman Canon, which, if you think about it, expresses the whole meaning of the Eucharistic Sacrifice. To the Father; through the Son; in the Spirit. (Which is why I am so dubious about one of the Church of Ireland's Eucharistic Prayers, which divides the Prayer up into three, with the first part addressing the Father, the second addressing the Son, and the third addressing the Spirit. What do readers think of that? Is it even valid?) And a vintage postcard from daughter Katie showing Pope John XXII, an admirable pontiff (and accompanied by a vintage guide to the pontifical palace at Avignon). We were able to detect that the negative was reversed in the course of production: the arms were the wrong way round! A happy occasion, last night, as I celebrated the 40th anniversary of my Ordination to the Sacred Priesthood. It was a Votive of the Holy and Undivided Trinity (in my day, most seminarians were ordained after the Whitsuntide Ember Days on Trinity Sunday) in Latin and according to the Extraordinary form of the Roman Rite; it was a very family occasion as our Bishop, Andrew, preached a sermon which was too kind about me and inadequately catalogued my failings. It also, as one would expect, combined a witty exposition of the mass texts (dealing with the creative mendacity with which they appear to attribute explicit Trinitarian orthodoxy to the Book of Tobit), a treatment of the glory due to the Trinity (as he observed, people are rather more respectful of the Trinity now than was true in the Year of Revolutions, when I was ordained), and a learned and pastoral discussion of the Hermeneutic of Continuity as it applies both to the use of traditional rites and the Reform of the Reform. He could do worse than to make those parts of the homily available to a wider readership. I was nervous beforehand; I have said low masses many times according to the 1950s Altar Missal kindly given to me a few years ago by a generous friend, the pp of Knightstown on Valentia Island in the Kingdom of County Kerry. Indeed, I used it even before the Holy Father issued his Motu Proprio (I hope this was not too daring an infrigement of my ordination undertaking only to use rites allowed by canon). But never before have I attempted a Missa Cantata. I need not have worried. Led by Barry, one of our senior and long-faithful servers, resplendent in our festal tunicle, a superbly competent group of seminarians from S Stephen's House swept me through it with aplomb enough to give the impression that they polished off this sort of thing every day of their lives. There is, of course, a history to this. 'Staggers', my own seminary, has long had a reputation for liturgical scholarship and practical accuracy in ritual matters. In the days when that great pontiff Bishop Kirk ruled the See of Oxford, the Principal, Canon Couratin (of whom many anecdotes survive, not all of them suitable for a family blog) used to turn up with his 'circus' to put on all the major Diocesan events. Even during the bleak years after the Council when so many lost their liturgical nerve, the Staggers tradition maintained standards and preserved a high understanding of the ars celebrandi. You might say that the advent of Pope Benedict is a vindication of all that Staggers has stood for and does still maintain under Fr Robin (who was present last night to see the triumphs of his students). The biggest of thankyous to Daniel Lloyd, who officiated as MC, and to his colleagues, a crew faultless not only in matters ritual. The choir was the Byrd Consortium, who descend from the choir at S Mary Mag's Church back in the happy days when it was Oxford's bastion of orthodoxy. I used to attend on Sundays and weekdays when I was an undergraduate, so there was a comfortable appropriateness in having them there. I am no musician, so I feel shy about ever commenting on the activities of those who are; I can only say that their memorable and haunting performance made me immensely grateful. I know how much work they put in. On July 14, we are to celebrate the 175th anniversary of the Great Catholic Revival in the Church of England - otherwise known as the Oxford Movement. Here at S Thomas's there will be an hour of prayer before the Blessed Sacrament exposed and then Mass at 12.30. In 1933 there were the celebrations for the Centenary: in the official handbook for that occasion, Lord Halifax concluded his Introduction with these words: And finally, let us remember that nothing less than the reunion of Christendom and the healing of the deplorable schism which so grievously affects the relations of the Anglican Communion with the Holy See, is the consummation of the work of the Oxford Fathers begun 100 years ago. On a more mundane level, may I ask readers to remember me in their prayers, particularly next Monday, June 9, when I hope, God willing, to celebrate the 40th anniversary of my ordination to the Sacred Priesthood. It is my intention to offer Holy Mass in S Thomas's at 7.00 in the evening.